The 18th century facade of No. 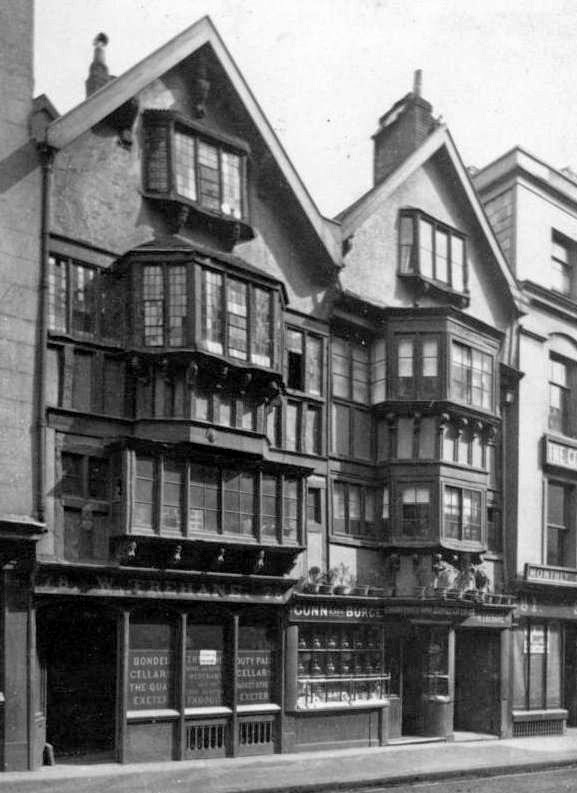 229, shown left © RAMM, belies the fact that this was in fact probably the most important surviving timber-framed Elizabethan townhouse in Exeter. The Royal Albert Memorial Museum regards it as "perhaps the grandest of all Exeter townhouses", although both Bampfylde House and No. 171 Fore Street were amongst several other contenders for that title. 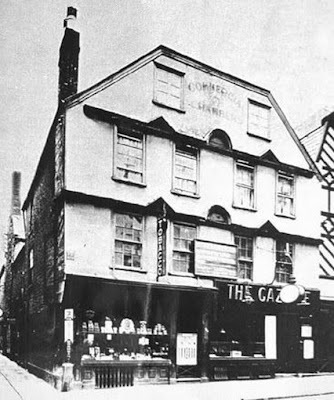 The building's history extended back into the Middle Ages where it occupied a prime site in the centre of Exeter on the corner of the city's main thoroughfare with Gandy Street. Surviving documents show that between 1394 and 1395 a house standing on this site was rebuilt using volcanic trap quarried from near the village of Thorverton in the Exe valley and sandstone quarried from Whipton (in fact 3,917 stones from Whipton were purchased!). The resulting construction would've been one of the most significant medieval properties in the city, consisting of a hall, bed chambers, a kitchen and stables with a cellar running underneath, as well as two shops at the front with solars above. Oak for the building came from stocks held by the cathedral and Baltic wood was even imported from Riga. It cost in total just over £173 with 53 men working on it for fifty-eight weeks. The image right is my attempt to suggest how the front elevation of the building might've appeared in the 1580s, based on other other buildings typical of the period. One of the city's most notable mayors, John Shillingford, lodged at the medieval house during the 1440s. At one point the property belonged to the Cathedral's Dean and Chapter and in 1544 it was leased by the Chapter to one of Exeter's wealthiest merchants, John Bodley. It was almost certainly in this house that Bodley's son, Thomas Bodley, later Sir Thomas Bodley and the future founder of the Bodleian Library, the main research library at Oxford University, was born on 02 March 1545. Being devout Protestants, the Bodley family left England during the reign of the Catholic Mary I in the 1550s, and it was upon returning to the country after the succession of Elizabeth I that Bodley entered Merton College at Oxford University. Bodley was well-acquainted with two other locally-born famous Elizabethans, the great miniaturist court painter and goldsmith Nicholas Hilliard and the explorer, poet and courtier Sir Walter Ralegh. The eponymous library at Oxford, one of the oldest in Europe and now only second in size to the British Library in London, was refounded in 1602 by Bodley and subsequently bore his name. The image left is a detail from Hedgeland's great wooden model of the city showing Exeter is it appeared in 1769. The front block of No. 229 High Street is highlighted in red. It it shown prior to the reconstruction of its High Street facade, its twin gables facing onto the street. The High Street runs left to right in front of the property with Gandy Street running up past the side wall. No. 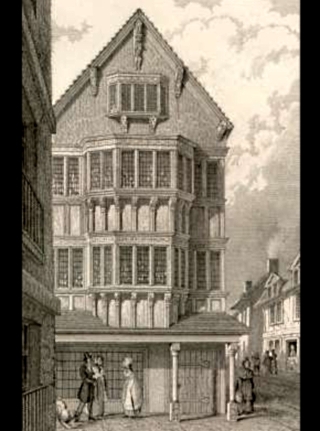 229 High Street was substantially rebuilt in 1585 by another of Exeter's wealthy Elizabethan merchants, and another former mayor, George Smith. Apart from 18th century alterations to the facade it was this house which remained standing until 1930. Yet another of the city's mayors, Roger Mallock, took out a lease on the house in 1627. The high status of the building could be seen in its sheer size. 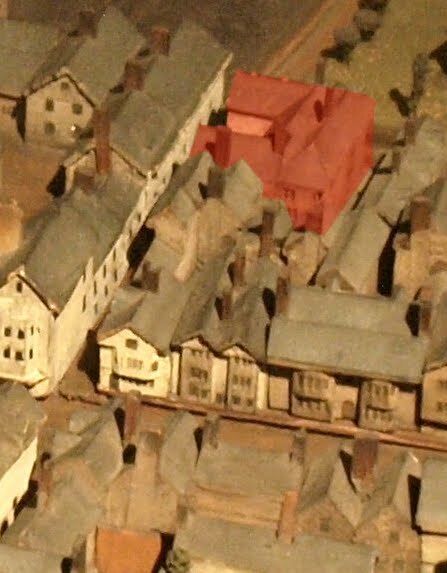 Many large merchant houses in Exeter were built as matching pairs, akin to modern-day semi-detached properties, one room wide and one room deep, with a further block of accommodation at the rear, but No. 229 was two rooms wide at the front, built as a single residence. By 1640 the property was being used as lodgings for visiting judges. In that year the judges complained about the accommodation. As William Cotton wrote in 1877, "there must have been something wrong with the furnishing or situation of Mr Mallock's residence to give any ground for complaint, as the house itself would, even now, if restored to its original state, be considered a grand one". Cotton goes on to give a description of the property as it existed in 1877: "The dining room was richly decorated with carved panelling of a high order, which is still to be seen, although the dimensions of the apartment have been curtailed; in a large room on the first floor a portion of the fine moulded ceiling and chimney-piece yet remain, and in the basement there are traces of an extensive kitchen, with a huge fireplace, now disused and partly filled with rubbish". No. 229 was still remembered as 'Mallock's House' on the 1876 Ordnance Survey map of Exeter. That map also suggests that the property was accessed via a passageway which ran underneath the right side of the house. Between 1584 and the 1630s, No. 229 acquired what were some of the richest, more ornate and opulent late-Elizabethan and Jacobean interiors in the entire city. 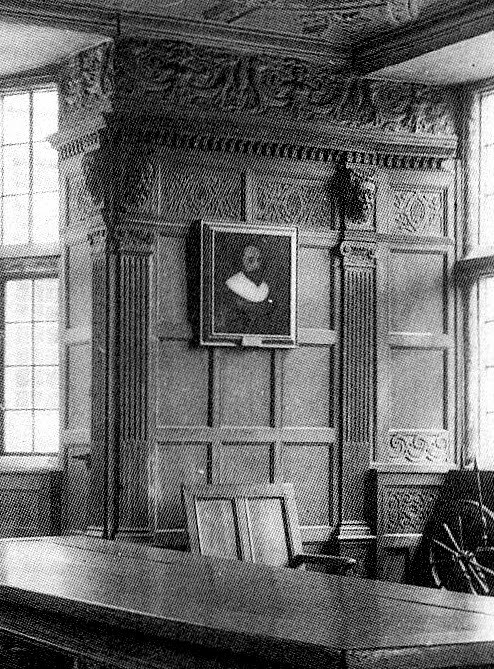 The British Archaeological Association visited the "ancient private Mayoralty hall of Roger Mallock" in 1862 and noted the "finely carved wainscoting". Fortunately enough records survive to indicate exactly what a loss the house was to the city's architectural heritage. At least three of the rooms had extremely ornate chimney pieces. The example shown above right, drawn in the 1880s by James Crocker, was made of oak and plaster. It had richly-carved pilasters either side of the fire itself, which were surmounted by grotesque masks, above which was an overmantel divided into three panels by pilasters with a frieze added to the top. In the central panel, probably executed in plaster, was the Royal coat of arms while either side were smaller heraldic details. 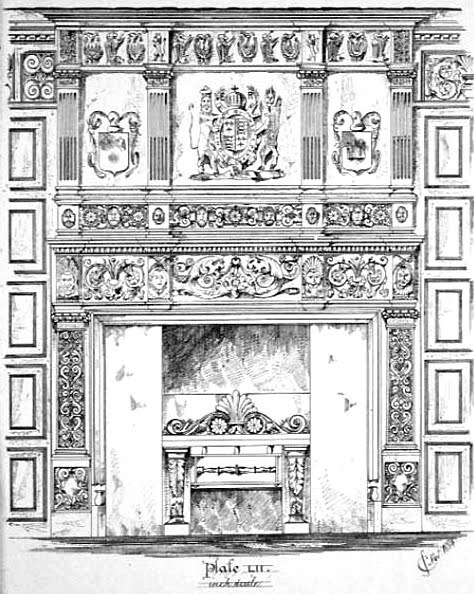 The image left shows the lower portion of a second overmantel. It is carved of oak and features two caryatids (sculpted female figures) in the centre, flanked at each side by two bearded telemones (sculpted male figures). Three Romanesques arches stand between them. Above each figure is a superb grotesque mask and the oak between the masks has been carved with stylised foliage (the soft wood panels within the arches are a much later addition). All of this work is typical of early-Jacobean carving and almost certainly dates to the time of Roger Mallock. This section of woodwork is now in the city's Royal Albert Memorial Museum. 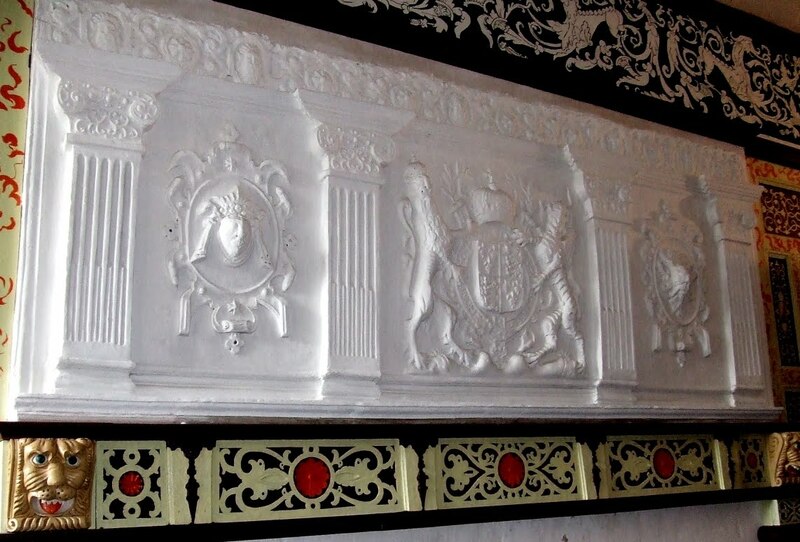 A third chimney piece, now in St Nicholas's Priory, featured the coat of arms of Elizabeth I, a lion and a Welsh dragon, and must've been installed by George Smith c1590. Either side of the fireplace are architectural pilasters that terminate in carved lion heads left. The overmantels were just the beginning though as the house was stuffed with rooms filled with elaborate oak panelling and wainscotting, with carved doors and decorative plasterwork ceilings. These interiors were a magnificent example of the English Renaissance, customed made for the house into which they were fitted. Their only counterpart in Exeter in the 20th century were to be found at Bampfylde House (destroyed 1942) or at No. 171 Fore Street (demolished in the 1930s). The photograph right shows Exeter's High Street c1910 with No. 229 highlighted in red. No. 226 and No. 227 stand to the left. Most of the buildings to the right of No. 229 were destroyed during World War Two. Clearly someone realised the value of the decor that was being removed. A year earlier Robertsons of Knightsbridge, a company specialising in the sale of antique interiors, descended on Exeter and removed the panelling, ceilings, woodwork and plasterwork from six entire rooms. These six interiors were then cobbled together to form three coherent rooms. The three rooms were then packed into crates, shipped across the Atlantic and sold to another company, French & Co. French & Co. then sold all three rooms to William Randolph Hearst. In 1940 one of these rooms was acquired by the Nelson-Atkins Museum in Kansas City (where it can still be seen today). A second room was gifted by the Hearst Foundation to the Detroit Institute of Art in 1958 (where it can still be seen today). The third of the rooms from No. 229 was bought from Hearst for $5000 in 1945 by Mrs John Magnin, after which it was gifted to the DeYoung Museum in San Francisco. In 2001 this third room was purchased by the Royal Albert Memorial Museum in Exeter. 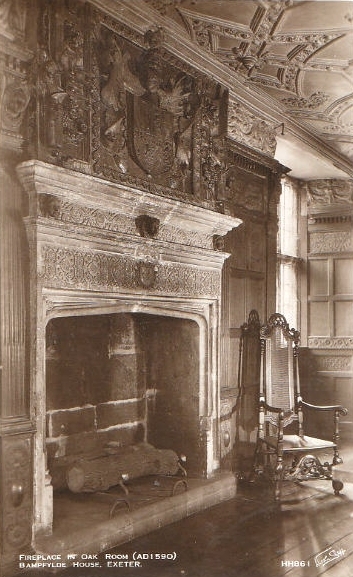 Apart from the oak panelling, the section of the overmantel shown above were also purchased at the same time, following a grant of £9,848 from the Victoria & Albert Museum in London. 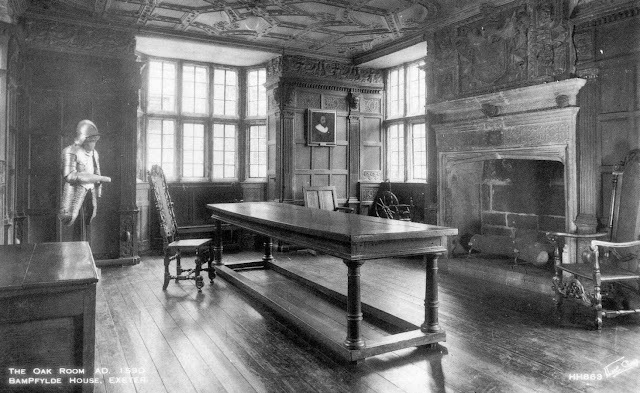 The repurchased panelling and plasterwork overmantel are currently on display in the Tudor Room of St Nicholas's Priory below. Apart from the scattered remains of its incomparable interiors there is no trace today that the house ever existed. Peter Thomas calls No. 229's demolition in 1930 "an act of considerable vandalism". And so it was. Dozens of medieval and Tudor houses were demolished in Exeter during the first three decades of the 20th century, but there's something particularly shameful about the city's heritage being dismantled and flogged off. However, by a strange quirk of fate, the destruction of the building probably saved the interiors that remain today. The present building that stands on the footprint of the old Elizabethan house was damaged by fire during the bombing raid of 1942. More can be read about it here. It's highly likely that, had the old house not been dismembered and demolished, then the entire lot would've burnt to the ground. 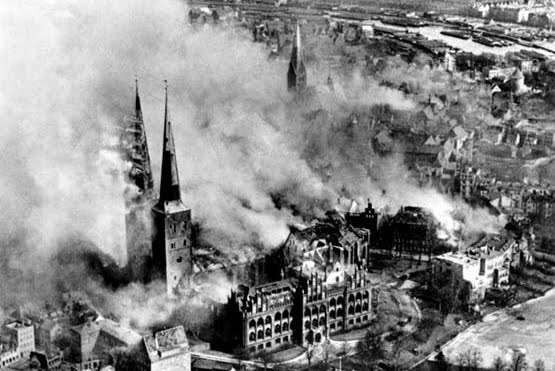 The photograph above shows the ancient Hanseatic port of Lübeck in Germany as a smouldering ruin the day after it was destroyed by RAF Bomber Command in the early hours of 29 March 1942, and the history books tell us that the Baedeker Raids began here. The material damage to the German city was enormous. The medieval cathedral and the church of St Mary were totally destroyed along with nearly 1500 houses, many dating back to the Middle Ages and the Renaissance, and another 2000 were severely damaged. The raid on Lübeck is often cited as being the consequence of a development in RAF Bomber Command which regarded the morale of the enemy population as being a target in its own right. The head of Bomber Command, Arthur Harris, later stated that "Lübeck went up in flames [because] it was a city of moderate size of some importance as a port, and with some submarine building yards of moderate size not far from it. It was not a vital target, but it seemed to me better to destroy an industrial town of moderate importance than to fail to destroy a large industrial city". Whatever the ethical justification of the bombing of Lübeck, a subject which strays well beyond the subject of ths post, the consequences for English cities were obvious. Hitler appears to have been incensed with the destruction of what was a relatively undefended city of immense architectural importance and ordered retaliatory attacks on industrially unimportant but culturally valuable cities in England. 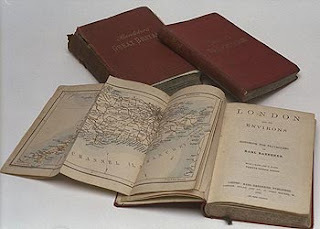 The name of these attacks supposedly derives from a statement made by Nazi propagandist Baron Gustav Braun von Sturm, who said that the Luftwaffe would work its way through the Baedeker Guide to England, destroying those cities of rich cultural significance or picturesque charm with buildings that received Baedeker's highest three-star rating. Initially only four cities were selected. Exeter was the first city targeted, on 23/24 April 1942, a raid which did relatively little material damage. This was followed by raids on Bath, Norwich and York before the Luftwaffe returned to Exeter in the early hours of 4 May 1942 and destroyed nearly 40 acres of the city. Canterbury was bombed at the beginning of June, probably in retaliation for the destruction of Cologne at the end of May 1942. 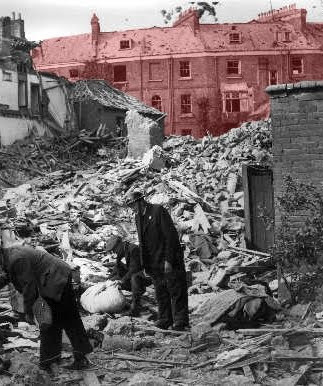 Over 1600 civilians were killed in total and, outside of Exeter, some significant historical buildings and streets were damaged or destroyed e.g. the medieval Guildhall in York and the 18th century Assembly Rooms in Bath, as well as Bath's Royal Crescent and the medieval St Augustine's Gate at Canterbury (shown above left and restored after the war). 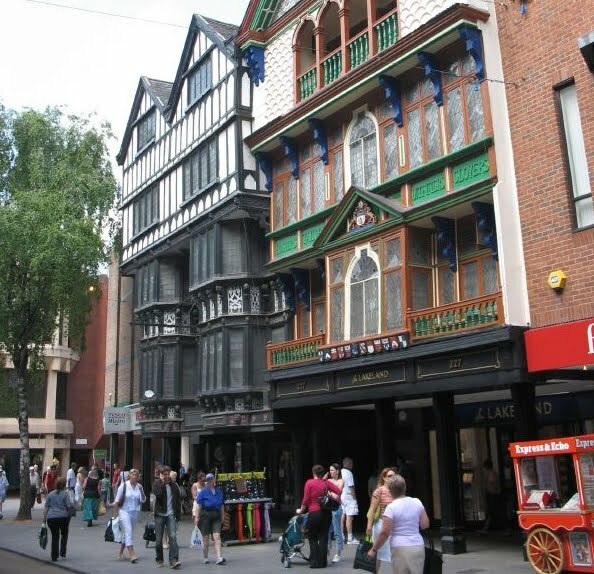 But the structural damage to Exeter was immense, partly because of the compact nature of its city centre, with most of its historic core laid out along a central street running through the city, and partly because much of the city was still built of wood. 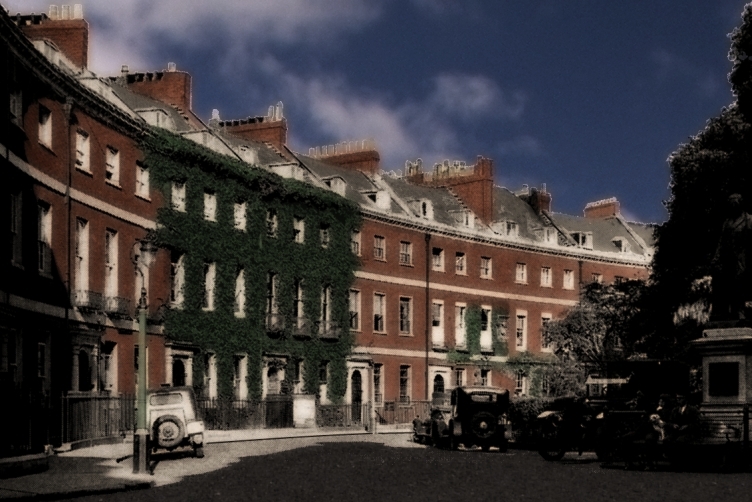 Unlike Bath, much of which was restored back to its pre-war condition, the local authority in Exeter made no such effort and nearly everything damaged in 1942 was demolished in its entirety, irrespective of its historical and/or aesthetic value. In each of the Baedeker target cities the most significant targets, the abbey at Bath, the cathedrals at Exeter, Norwich and Canterbury, and the minster at York all survived relatively unscathed. 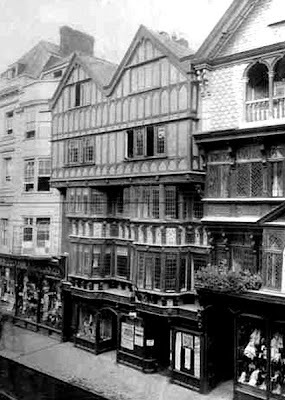 These two magnificent timber-framed merchant houses were built in the early decades of the 17th century and stood for over three centuries at the top of Fore Street. The house on the left, No. 78, was the older of the two, dating to around the 1610. No. 79 dated to c1640. Both were distinguished by the exceptionally elaborate projecting oriel windows that jettied out over the pavement of Fore Street, the frames being supported on carved oak corbels. The only similar windows that survived into the late 19th century in Exeter were at Nos. 19 and 20 in North Street, demolished c1890. The name by which the two houses were known in the early 20th century originated from a terracotta ridge tile in the shape of a knight on horseback that stood on the gable end of No. 79, peering down into the street below (just visible in the photo below). 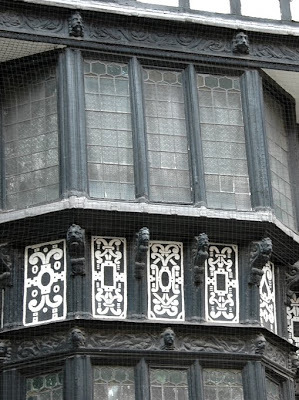 These roof finials were once fairly common across the city in the 16th and 17th centuries but the one on the Chevalier inn was the last to survive in situ, said to mark the site of a house that lodged cavalier soldiers during the English Civil War. In 1829 No. 78 was purchased by John Trehane, a Justice of the Peace, and the Trehane family owned it until it was sold in 1889 to Charles Ham, a wine and spirits merchant. In 1879 No. 79 was a pharmacy run by a Mr Thompson and was later a wallpaper and paint shop and a bookshop. By 1942 the two properties functioned together as the Chevalier inn. The interiors were as impressive as the exteriors as both houses had rooms of panelling, decorative plaster work ceilings and stone fireplaces. (More information on the plaster work ceilings that once existed at No. 79 Fore Street can be found here.) An 1879 tourist guide to the city recorded that "many of the interiors are peculiarly rich in walnut wainscot and shields of arms and will well repay a visit from the antiquarian and archaeologist". 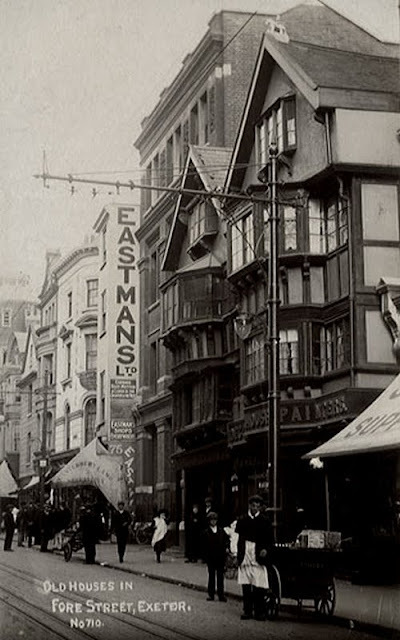 An article in Trewman's 'Exeter Flying Post' dating to 1899 stated that "such a rare piece of antiquity will absorb for a while the whole attention of the onlooker", describing the two properties as "among the glories" of Fore Street. It's hard to argue with the assessment. Until the 18th century at least, No. 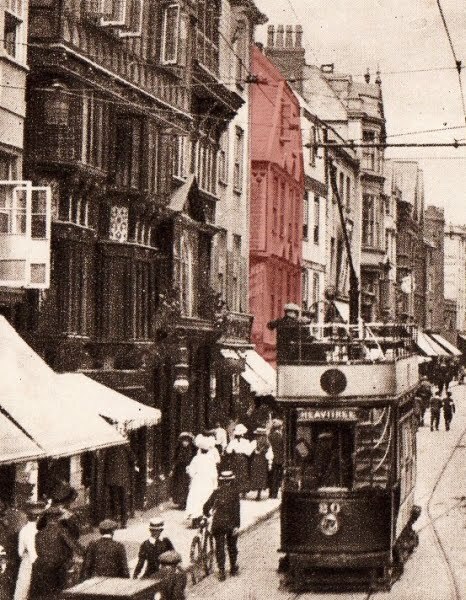 79 appears to have stood on the corner of Fore Street and a now long-vanished lane which led into George Street. The lane appears on Benjamin Donn's 1765 map of Exeter in about the right place. The Fountain inn, probably named after the nearby water conduit, stood nearby. Further evidence for the existence of this lane appears on a drawing of what I believe is No. 79 Fore Street. The drawing left appeared in an 1848 edition of the 'Gentleman's Magazine and Historical Chronicle' but had actually been executed some years previously. It was only titled 'Elizabethan House at Exeter'. In appearance it is almost identical to surviving photographs of No. 79 High Street. The major differences are the arrangement of the door and windows on the ground floor and the absence of the little terracotta figure of the knight on horseback. The great oriel windows on the first and second floors are exactly the same. If it is No. 79 High Street then it suggests that the property was originally built as a corner house. The lane visible to the right is shown on a map of 1832 but had disappeared by the 1860s. Anyway, these superlative houses were two of Exeter's most well-known landmarks. Both properties were threatened with demolition in 1929 but a campaign by numerous organisations and individuals resulted in them being saved, purchased by the City Council with help from a £10,000 government loan. Just 13 years later in the early hours of 4 May 1942, both houses, the finest timber-framed buildings left in the city, were incinerated by German firebombs. No trace of the buildings survive today, not even the little terracotta figure of the knight on horseback, and now the area is one of the ugliest, most visually unappealing in the whole city. In the book 'Aspects of Exeter', Jacqueline Warren recounts a legend attached to the terracotta figure. It was claimed that every March the figure would leave the top of the gable and gallop to the Cathedral where it ascended one of the towers, looking out over the city towards the fields of St Leonard's in remembrance of the time during the English Civil War when the Royalists were holed up in the city and General Fairfax's Parliamentarian army was camped to the south. 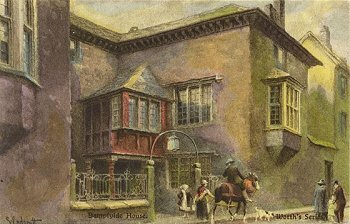 Before 1942, on the corner of Bampfylde Street, a very narrow lane leading to the High Street, stood the late-16th century Bampfylde House above. Bampfylde Street was once known as Raden Lane and was barely 14ft across. The house itself stood on the corner of Bampfylde Street with Catherine Street. At the time of its destruction it was, by far, the most important late-16th century domestic building in the city, renowned for the exceptional quality of its Jacobean interiors. Bedford House, the nearby residence of the 1st Earl of Bedford, John Russell, was significantly larger but was demolished in 1770s. 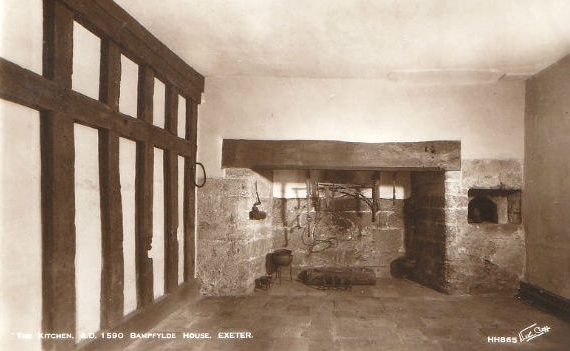 Construction of Bampfylde House began in 1590 for a wealthy Devon landowner called Richard Bampfylde, although archaeological excavations in the late 1940s confirmed that the house was built on the site of an earlier medieval building, probably the property that was mentioned in a will dating to 1394. The house took the form of a large accommodation block attached to which were two projecting wings forming a small central courtyard with a porch built into the right-angle at one side, all constructed from the local red stone known as Heavitree breccia, and with a slate roof on top. After the death of Richard Bampfylde in 1594 the house became the property of his son, Sir Amyas Bampfylde, who set about enriching it with the most ornate and elaborate interiors typical of the late-Elizabethan period. Although the house no longer exists, it was visited in the late-19th century by Robert Dymond, a local historian and Fellow of the Society of Antiquaries. An article on the property appeared in the periodical 'The Archaeological Journal' in 1874. Much of the following information is derived from Dymond's account. Dymond noted that walls which immediately fronted onto Bampfylde Street contained no windows on the ground floor, the light being received instead through "three large mullioned windows" in the courtyard. The reason for this was one of security: "When the entrance to the court[yard] was closed, the inmates were secure from night marauders and civil broils. They might even hold out for a time after the City gates had yielded to the sudden incursion of an enemy." The front wall must've been at one time significantly higher than it appeared in the 19th century. Dymond then goes on to relate an incident that took place on 19 July 1769 when the the 4th Duke of Bedford, owner of Bedford House, turned up at the Guildhall to be given the freedom of the city. The Duke, one of the most powerful political figures in 18th century England, had apparently made the mistake of agreeing with a clause in the Treaty of Paris which had ended the Seven Years War. The disputed clause allowed for the importation of French fabrics at the probable expense of locally-produced materials. Needless to say, the local population was enraged as Exeter's economy was heavily dependent on the sale of wool and cloth. Upon leaving the Guildhall the Duke was met with the "hisses and threats of a furious mob" and, accompanied by the mayor and Sir Richard Bampfylde, he hurriedly seeked refuge in Bampfylde House. The Duke eventually fled Exeter under the cover of darkness and it was soon after this event that Bedford House was demolished by the Duke for the construction of Bedford Circus. Back to the house itself, and in one corner of the courtyard was a very large lead water cistern above left. It was, writes Dymond, "cast in lead of great thickness...the front side bears the letters Sr C.W.B. [Sir Coplestone Warwick Bampfylde] and the date 1724 surmounted by a representation of a fat stag pursued by three hounds and a huntsman on foot, bearing a spear." The image below right is a detail from Caleb Hedgeland's superb wooden model of the city which he completed in 1824. 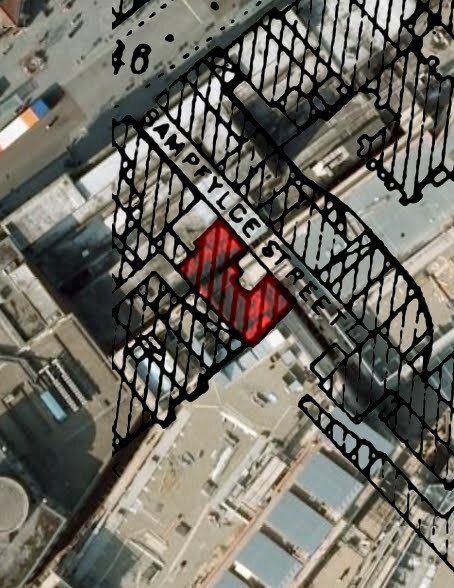 It shows Bampfylde House, highlighted in red. The High Street is in the foreground with Bampfylde Street leading off towards the house itself. Dymond speculated that the entrance porch set into the corner of the quadrangle was a slightly later addition "for it overlaps and partially obscures one of the upper mullioned windows". 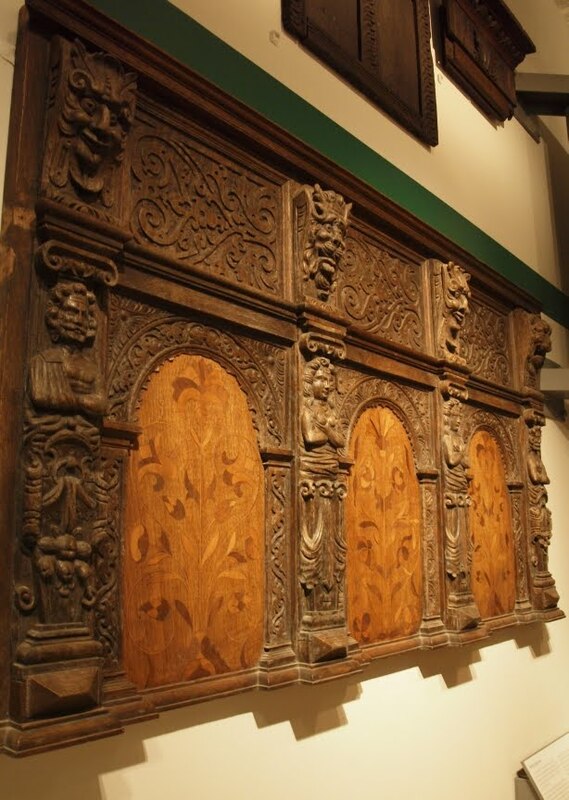 The posts were of oak and "enriched with lion's heads, of Elizabethan character, carved in relief, and connected by a carved frieze on the two external sides." The small chamber above the porch was an oak-panelled muniment room, used for keeping paperwork, deeds and documents. Entrance into the house was through the porch, which lead directly into the Hall, "a compartment of comparatively ample proportions". 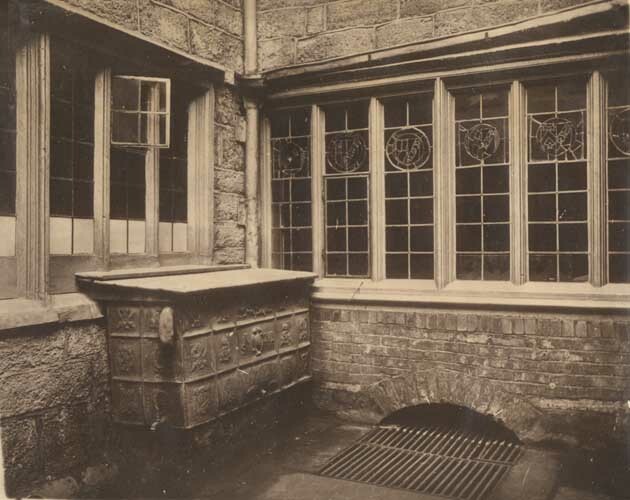 The Hall was lit by a six-light mullioned window (visible in the photograph above left to the right of the lead water cistern). Inset into the panes of the window were various pieces of glass with armorial bearings, relating to the Bampfylde family, and which dated back to the 15th century, probably transferred from elsewhere. The Hall formerly possessed a magnificent overmantel depicting Charles I on horseback with figures of Peace and Plenty on either side and grotesque statues of a Cavalier and Puritan soldier. This was added to the house at the time of the Restoration of Charles II in 1660. It was still in situ when Jenkins visited the property at the start of the 19th century, but between then and the time of Dymond's article the overmantel was moved to the Bampfylde country estate at Poltimore on the outskirts of Exeter before being moved once again to a house in North Molton. Beneath the Hall was a cellar, accessed via a flight of stone steps from the courtyard outside (the grating that covered the entrance into the cellar is visible in the photograph showing the lead cistern). The cellar had a groin vault made of red brick supported on a pier nearly 2ft square. Dymond believed that the cellar was "original work" but brick wasn't freely available in Exeter as a building material until the mid-17th century, although there are scattered documentary references to it in the cty as early as 1578. In one corner of the Hall was the main staircase, described by Dymond as "broad and easy". Although the treads had been replaced, the oak newel post and the panelling on the walls were both of Elizabethan origin. For the servants a smaller, secondary staircase, "narrower and winding", had been installed at the rear of the property, its original octagonal newel post still remaining. Upon arriving at the landing on the first floor a doorway led into what was not only the finest room in the house but one of the finest rooms of its type in England: the so-called Oak Room, described by Dymond as "a truly noble apartment". It was the appearance of this room in particular that made Bampfylde House a treasure trove of Elizabethan and Jacobean craftsmanship. The walls of the Oak Room above were covered with oak panelling "extending from the floor to within a foot of the ceiling". The panelling was divided into sections with shallow fluted Ionic pilasters. The pilasters were crowned with superb grotesque masks "in bold relief and of most spirited design." Running between the masks were a series of carved panels depicting stylised flowers and geometric shapes, "consistent with each other in character, but freely varying in design". Between the top of the panelling and the ceiling was a plaster frieze depicting human figures, the hands merging into intertwining patterns of foliage. The plaster overmantel was exceptionally ornate right. Placed in the centre was a large depiction of the Bampfylde coat of arms, impaled eight times with various other families and surmounted by a knight's visored helmet which was in turn surmounted by a lion's head in profile. On either side stubby-nosed lions peered out, and underneath the lions were swags of fruit. The fire surround was carved from limestone with yet more faces and lions set into the stonework amidst complicated geometric shapes. The incredibly rich decoration of the walls continued in the extremely complex early-17th century plasterwork ceiling, "a fine example of the designer's taste and the modeller's skill", the strapwork design embellished with more foliage. The Oak Room was lit by three mullioned windows, one of which, three bays wide, overlooked Bampfylde Street. The other two, one either side of the overmantel, looked down into Catherine Street. In 1942, the Oak Room was certainly the finest room of its type left in Exeter, the similar rooms in No. 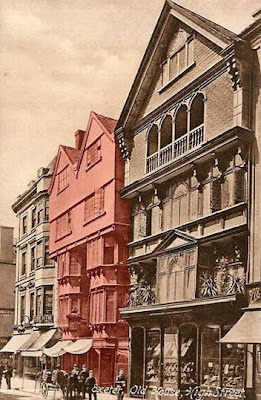 229 High Street having been broken up and sold or destroyed in the 1930s. More about the various plasterwork ceilings in Bampfylde House can be found here. The other rooms in Bampfylde House were similar, if perhaps not quite so fine, and dated, like the Oak Room, from the end of the 16th century to the 1630s. There were two other rooms on the first floor, apart from the Oak Room. Both were partially panelled in oak and had decorative plasterwork ceilings, one of which also had a three-bay window that looked out over Bampfylde Street. The second floor contained several bed chambers, at least one of which had a simple plasterwork design in the ceiling as well as a large fireplace. Also on the ground floor was a large kitchen above which had a huge fireplace with a massive timber-framed partition wall made of oak. There were also a series of smaller service rooms at the rear of the property that were accessed through a small gateway to the right of the main entrance. At least in the 19th century there was still a courtyard at the rear overlooked by a gabled window set into the roof. By the time Dymond visited, the garden which once stretched as far as the City Wall was covered with stabling. When Sidney Heath wrote his guidebook to Exeter in the early-20th century it seems as though this rear courtyard had been fiddled with. Speaking generally about the city, he wrote that "there has been an appalling amount of destruction, some of it apparently of an unnecessary kind, [such] as the recent dismantling of the beautiful old courtyard in the rear of Bampfylde House". The map left shows Bampfylde House on a street plan of 1905 combined with an aerial view of the same area today. 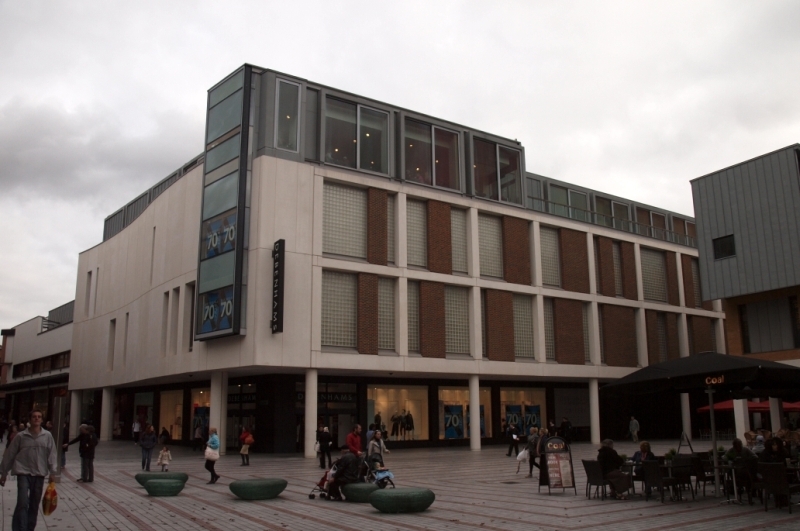 The site is now part of the puerile new multi-million pound Princesshay shopping development. In 1934 the City Council purchased the property from Arthur Guest, who had spent much time and money on restoring the interiors of the the house. An article on the acquisition appeared in The Times stating that Bampfylde House was "considered to be the finest sixteenth-century town house still in existence west of Salisbury" with the exception of the Red House at Bristol. The Council paid £5000 for Bampfylde House and turned the entire building into a museum, stuffing it with period tables, chairs, coffers, beds, wall hangings and pictures, and it opened to the public for the first time on 07 November 1934. It was therefore a massive loss to the city's architectural heritage when, just eight years later, Bampfylde House, along with all its contents and all its extraordinary interiors, was totally destroyed by incendiary bombs in the early hours of 4 May 1942. By the following day there was nothing left except the broken remains of the walls right © Express & Echo. The photograph, frequently misidentified as Lower Market Street, actually shows the clearing of war-damaged property around Bampfylde House. The very narrow Bampfylde Street can just be made out running in front of the property from right to left. It's possible that enough of the building had survived to allow a reconstruction, but it was never going to be possible to replace the magnificent interior. Unfortunately, in the post-war rebuilding of Exeter, Bampfylde Street on which the house once stood was all but obliterated, and today there is no sign that the house ever existed. A tiny scrap of the plasterwork frieze was salvaged from the Oak Room and is currently in the Royal Albert Memorial Museum in Exeter. And that was the end of Bampfylde House. Some semblance of old Bampfylde Street was retained during the post-war reconstruction. 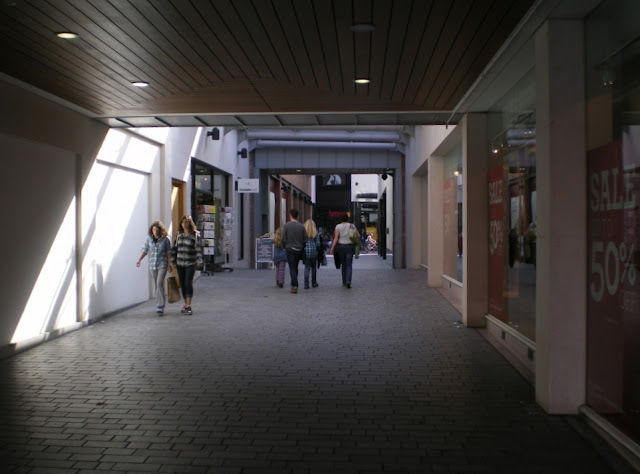 It consisted of a nameless, dirty passageway, twice the width of the original street, which led from the High Street into the pedestrianised precinct known as Princesshay. During the recent bland remodelling of the area this passageway was retained and renamed Bampfylde Lane below, but it is small recompense for the loss of one of the Westcountry's most significant historical buildings. People familiar with Devon might know The Walronds at Cullompton, built in 1605 for a lawyer named John Peter. Now a Grade I listed building it gives a some idea, in both size and design, of how Bampfylde House appeared prior to its destruction in 1942. 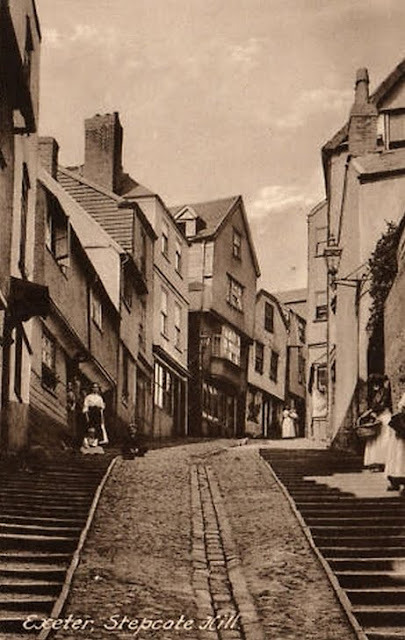 At the beginning of the 20th century Stepcote Hill in Exeter's ancient West Quarter was a magnet for artists and photographers wanting to capture both the social life of Britain's poor and a visual reminder of England's medieval past. 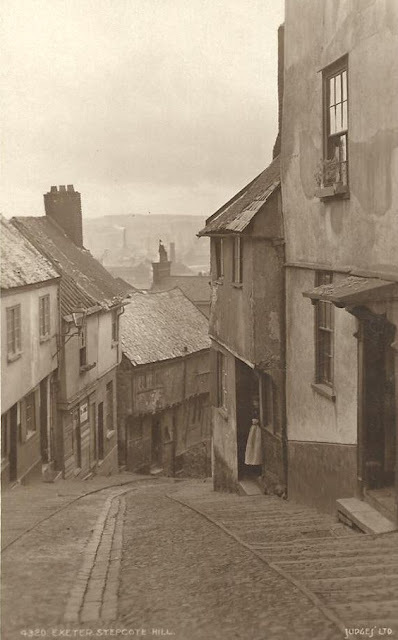 The image left shows Stepcote Hill c1890 as it ascended the steep slope towards the plateau on which most of the historic city was built, and still lined with numerous late medieval and early post-medieval timber houses. 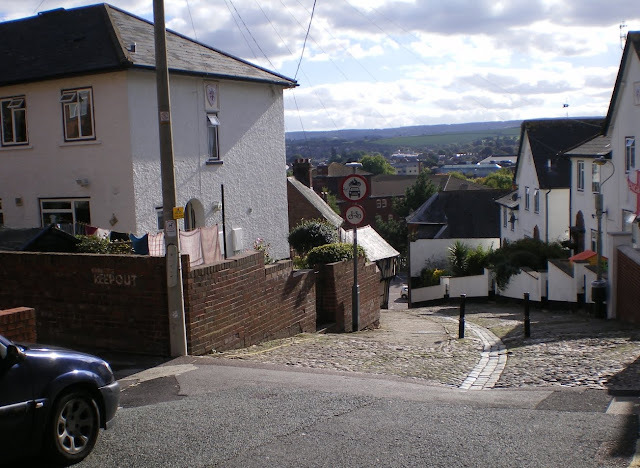 It has been conjectured that the route itself is Roman in origin but in the Middle Ages Stepcote Hill was probably the main thoroughfare into Exeter from the west. Having crossed the medieval Exe Bridge, you would've passed under the West Gate set into the city wall before travelling up into the city itself. The street only fell out of use in the 1770s when a new bridge replaced the old medieval one. According to Hoskins the name itself derives from the Anglo-Saxon word 'stype', meaning 'steep', and even today it remains the steepest route into the city. 'Cote' probably comes from the Anglo-Saxon word for an enclosure. It's recorded c1270 as Styppecotehyll. As befitted a major thoroughfare, Stepcote Hill was once lined with the houses of Exeter's wealthiest medieval merchants, eager to have premises in what was essentially Exeter's commercial centre. Much of the rest of the land contained within the city's encircling defensive wall was taken up with the ecclesiastical precincts of various churches and monasteries, especially the Benedictine foundation of St Nicholas, the Dominican friary near the East Gate and the Cathedral precinct itself. 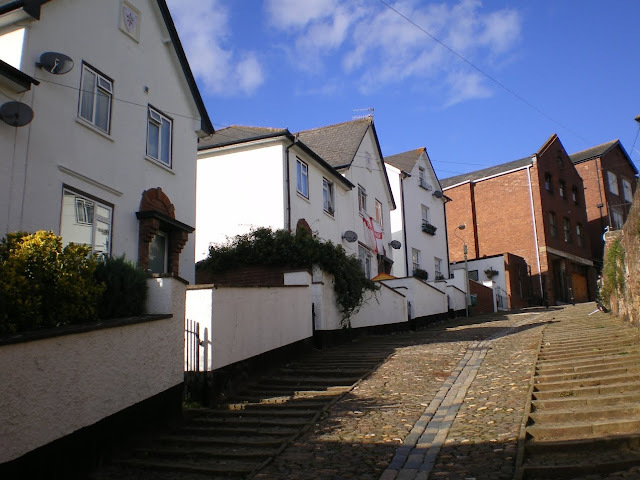 This part of Exeter, including Smythen Street, Preston Street and Coombe Street was therefore a mainly secular maze of narrow lanes, courts and streets consisting of merchant houses, workshops and warehouses, known collectively as the West Quarter. 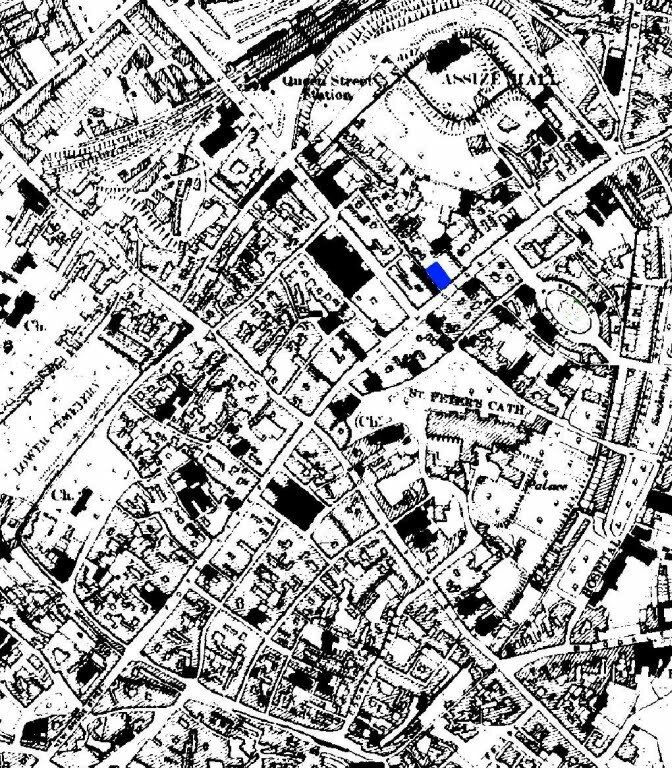 For a map showing the extraordinary extent of demolition in the West Quarter during the 20th century see the post on the church of St Mary Major. After the land-grab of the Reformation many more domestic properties were built on land once owned by the religious houses and gradually, over a period of several centuries until the 1800s, the social and economic importance of Stepcote Hill, and the West Quarter generally, diminished, even if much of its medieval architecture remained intact. 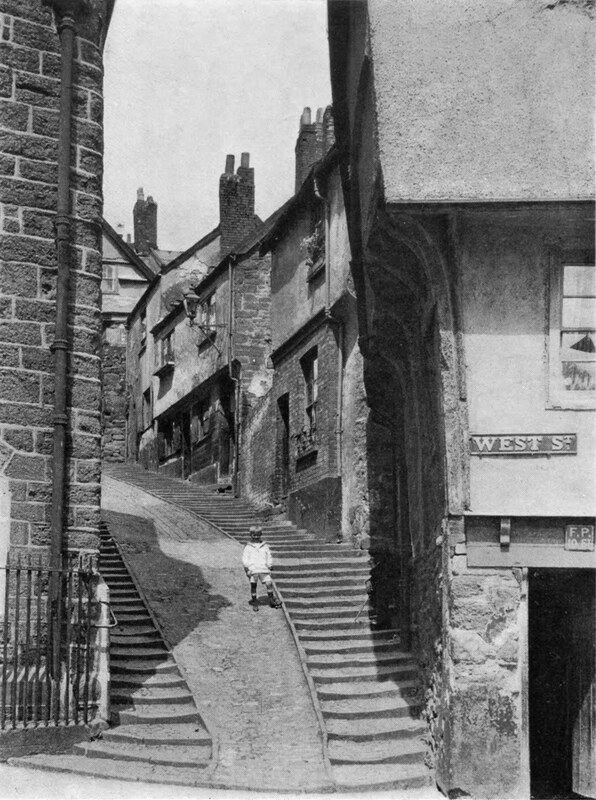 The photograh left shows the narrow entrance into Stepcote Hill from West Street c1930, the medieval church of St Mary Steps just visible on the left. By the 19th century the area was a notorious slum and the frequent location of outbreaks of cholera and in the 1930s the city authorities decided to relocate the poorest inhabitants to a new area beyond the city wall. However well-meaning the philanthropic intent, it was a catastrophe for Exeter's architectural heritage as every building on the Hill, including all the jettied, timber-frame merchant houses, was totally demolished without any record being made of what was being destroyed. Only one late-15th century house survived, on the corner of Stepcote Hill and West Street. 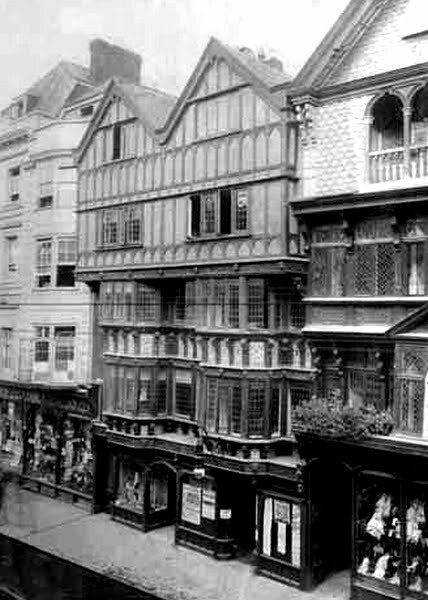 In the process Exeter lost some of its most important surviving medieval and 16th century domestic houses from one of its most important surviving medieval streets. Today there is little to see of any architectural or historical interest. The only remaining historical feature, apart from the corner house and the wall of St Mary Steps church, is the ancient cobbled street surface with its central gutter and steps on either side. This is Grade II listed. The city council website calls Stepcote Hill 'picturesque'. It really isn't. The merchant houses were all replaced with bland, functional brick-built properties that have little to recommend them and which wouldn't look out of place on any estate in any suburb in any city in the country. What a sad loss this was. No. 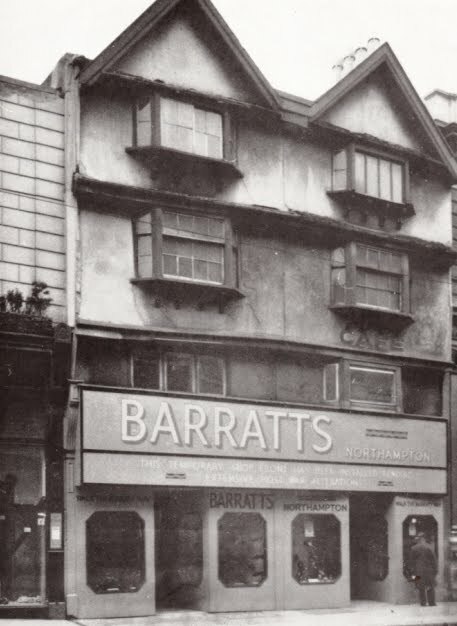 241, left © Brufords, was situated on the High Street in the centre of the city and, according to Peter Thomas in his book 'Aspects of Exeter', was the townhouse of the Earls of Morley. The Earls' family seat was at Saltram House near Plymouth, a superb survival of a George II country house but when they visited Exeter they apparently lodged at No. 241. The problem with the Morley connection is that it only takes us so far with the history of the house. The title of the Earls of Morley wasn't created until 1815 and their townhouse in Exeter was considerably older. At first glance it appears to be typical of the double-gabled early-17th century merchant houses that were once common in Exeter but I think it dated to the mid-17th century, possibly the 1660s. It was similar in style to Nos. 211 & 212 further down the High Street but built on a large scale. 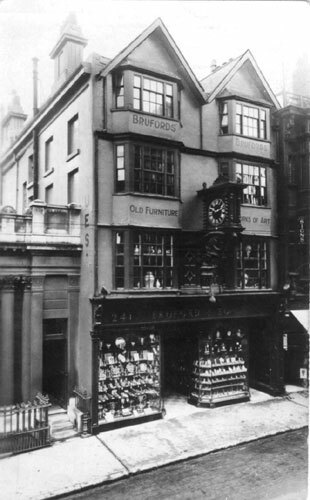 At the beginning of the 20th century the building was purchased by Brufords, a well-known firm of Exeter jewellers, the finely panelled rooms, original staircase and fireplaces being a perfect foil for their stock of antique silver, jewellery and furniture. 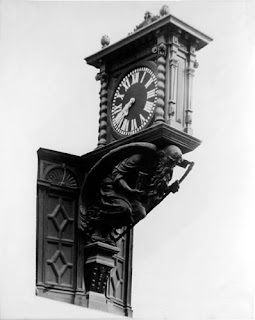 The most notable feature of the building's exterior was undoubtedly the extraordinary clock, right © Brufords, that projected from the facade over the pavement of the High Street below. It was carved by a prodigiously talented local ecclesiastical sculptor called Harry Hems and depicted an enormous crouched figure of Old Father Time, an hourglass clutched in his right hand and a scythe in his left, literally supporting time on his back. The entire structure, including the clock and all of the interiors, was completely destroyed by fire during the bombing of Exeter in the early hours of 04 May 1942. 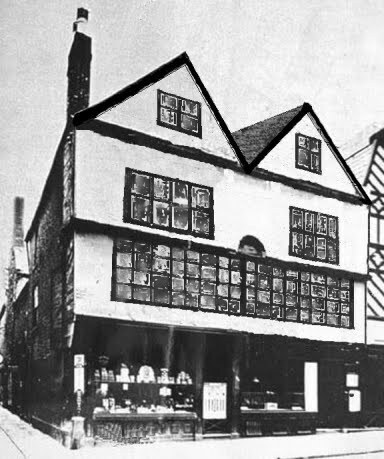 Look past the shabby shop front and the modifications to the first floor windows and there lie a matching pair of Tudor merchant houses built c1570 in a prestigious location on the city's main thoroughfare. They were typical examples of the sort of building that would've filled the city streets by the beginning of the 17th century. Each house was one room wide, with a courtyard and kitchen block at the rear, the largest and most expensive room being reserved for the parlour on the first floor. During the bombing of Exeter in 1942 the house came within metres of being destroyed by fire but the flames were extinguished just before they reached the building. At one point the building to its left, a fine Georgian bow-fronted house from 1805, was actually ablaze. The reprieve wasn't to last long. 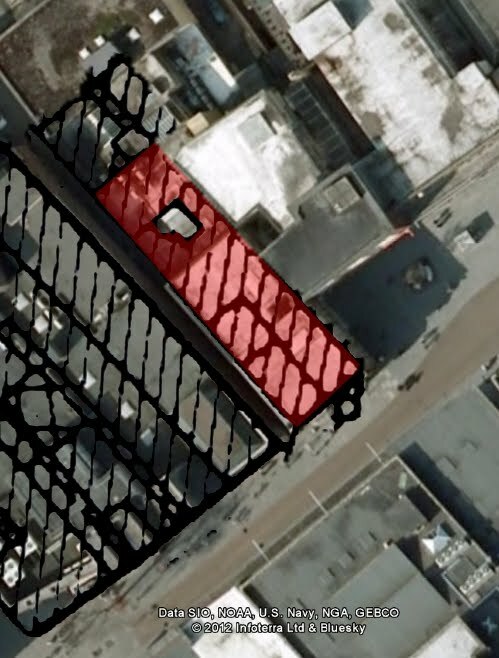 The site was ear-marked for redevelopment. An structural survey of No. 37 allegedly discovered that that the building was dangerous and it was conveniently declared to be unsafe. How fortunate for the developer and what a coincidence that the fine stone bank building at No. 38 was also demolished soon after. Perhaps it too was 'unsafe'. The alleged structural instability was just the excuse that was needed. Having existed since the 16th century, having survived the English Civil War of the 1640s and the Blitz of 1942, and despite the fact that the city had already lost so many historic buildings to German bombs, No. 37 was subsequently demolished in the 1950s and replaced with the building shown right. Had the building survived into the 21st century then it would've looked almost identical to Nos. 41 & 42, which is now one of a handful of remaining timber-framed buildings in the city today. The historian W.G. Hoskins called it "one of the finest pieces of Georgian town-planning in England"; for Sir Albert Robertson it was an "excellent grouping" and "representative of the refinement of the day"; Professor Derek Portman believed it was Exeter's "Georgian minor masterpiece"; Thomas Sharp, the city's post-war town planner, wrote that it was "one of the best examples of unified urban architecture in England: something near perfection of its kind, the quintessence of the 18th century philosophy of town building"; and into the 21st century the destruction of Bedford Circus is often regarded as one of Exeter's biggest architectural losses. The history books often state that it was destroyed during World War Two, but it wasn't. Most of it was fire-damaged during World War Two but it was only actually destroyed completely by the city council in the post-war rebuilding of the city. The decision to remove it was a blatant act of cultural vandalism. The idea for Bedford Circus started with Robert Stribling, a speculative architect/builder who, in 1773, who began the construction of 14 townhouses on the site of John Russell's Bedford House, itself a remnant of a Dominican Friary which had been on the same location from the 13th century until it was dissolved in 1538 during the Reformation. The image left is based on Caleb Hedgeland's model of Exeter. The model depicts the city as it was in 1769, prior to the construction of the Circus. Bedford House is highlighted in red. At least one of its three ranges was formerly part of the Dominican Friary. Bampfylde House, on the corner of Catherine Street and Bampfylde Street, is highlighted in green. Chapel Street, also known as Egypt Lane, borders the Cathedral Precinct to the bottom left. The completed Circus, based on the 1905 map of Exeter, is highlighted in purple. It's easy to see how the north-eastern crescent, the first of the houses to be built, was constructed on top of Bedford House. The first stone of Bedford Circus was laid 27 May 1773. According to Jenkins "in digging for the foundation, great numbers of human bones were dug up, with the foundation of a church, broken mouldings [and] fragments of sepulchral monuments", all left over from the medieval friary. Lead coffins were unearthed and a lead box containing "three or four human skulls, and bones." The lead coffins were salvaged for scrap and the bones, much to Jenkins' disgust, dumped "among the rubbish, to the disgrace of humanity". Stribling's 14 houses took the form of a sweeping crescent, facing south-west towards the cathedral and were originally known as Bedford Crescent. 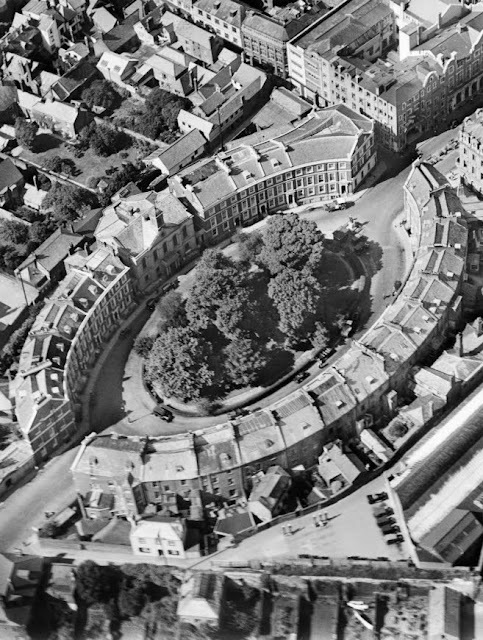 The ground facing the crescent was taken up with stables and other buildings, including Brown's Coach and Harness Manufactory. Tozer's 1793 map of the city clearly shows that the first crescent had been completed by the end of the 18th century. The photograph right shows one of the beautiful entrances which accompanied each townhouse. 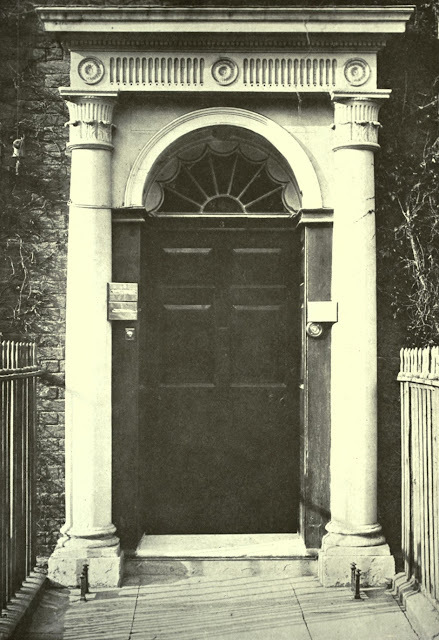 Tuscan columns with acanthus leaf capitals stood either side of an arched doorway above which was a scalloped-edged fanlight. After a hiatus of nearly 50 years preparations began for turning the crescent into an architectural circus. It seems that the creation of a circus had always been part of Stribling's original plan as it was being called Bedford Circus as early as 1803, over 20 years before steps were taken to complete it. A report in Trewman's 'Exeter Flying Post' dated 19 May 1825 states that "active measures are being taken for commencing the new houses on the Bedford estate in this city in order to complete the Circus as originally intended; Mr T. Horrell is the architect and builder; and we understand the Duke of Bedford has, with his usual liberality, satisfied all those who had any claims on the old building which has so long been a great nuisance, and disgraced this part of the city." The ground was still owned by the Dukes of Bedford but the report appears to suggest that remnants of old buildings associated with the sprawling Bedford House estate might still have existed on the site even after the completion of the first phase of the construction in the 1770s. Nine matching townhouses and an extra-parochial neo-Classical chapel (completed in 1832 and shown left) were eventually built in another crescent facing the one from the 1770s. In 1832 workmen digging a shaft for new sewerage pipes for the later houses discovered a new collection of human bones, including two skulls. When completed the overall effect of the Circus was of a gigantic ellipse, entered from the High Street via Bedford Street, with a small private park situated in the centre filled with mature trees and surrounded by iron railings. 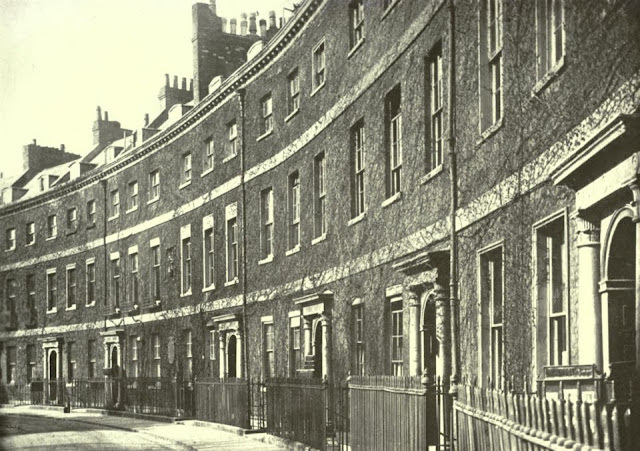 All the houses in Bedford Circus were of a similar type. They were built of locally-fired brick, earthy-red in colour, a white stone string course being used to separate each floor visually. The windows on the third floor of the later houses were slightly different but the architectural details were secondary compared with the overall impression of the whole scheme. The image at the top of this post is a composite of three separate photographs and is an attempt to try and give some indication of the magnificent visual impact of Bedford Circus as entered from the High Street. I'm not aware of any photographs which show the entire arrangement at ground level. Even today, had they survived, a wide-angle lens would've been needed to capture both crescents and the chapel in the same shot. The photograph below shows Robert Stribling's original crescent of 14 houses from c1773 as seen from the entrance into Southernhay. Careful scrutiny of the first floor of the facades will show the coat of arms of the Russell family, carved in stone and reclaimed from the entrance porch of old Bedford House. 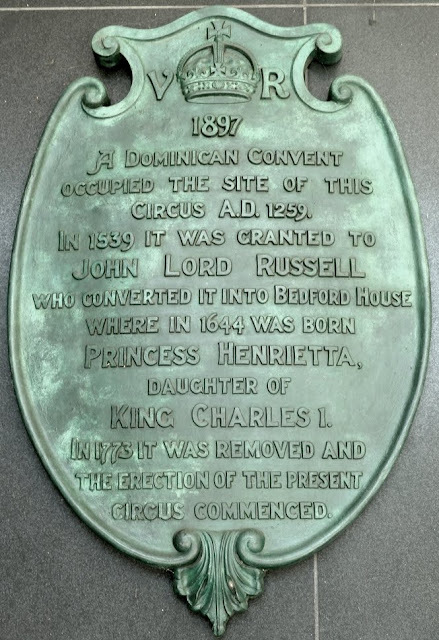 Beneath the coat of arms, on the ground floor, can be seen the late-19th century bronze plaque (shown further below) commemorating both the Circus and Bedford House. 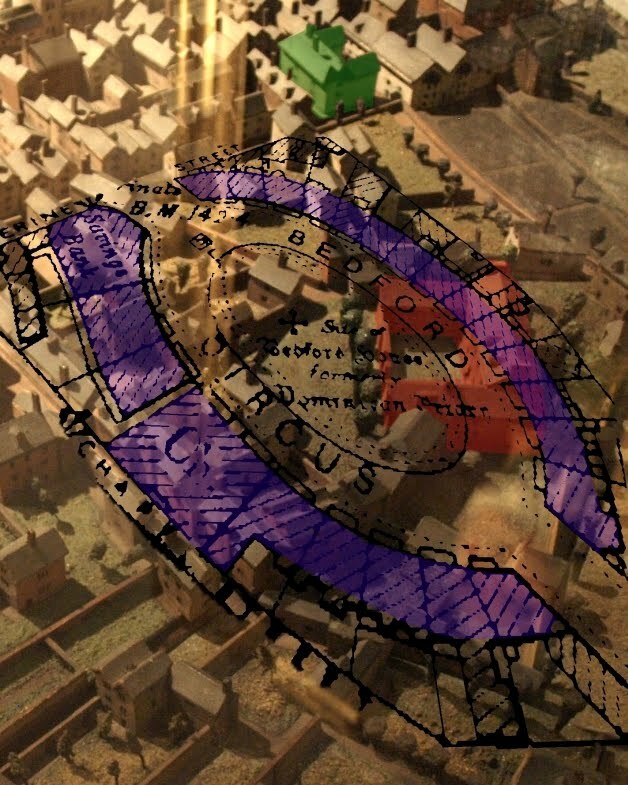 As an example of Georgian town-planning Bedford Circus was exceptionally rate and similar set-pieces could only be found in England in such places as 18th century Bath and the Bloomsbury area of London. For me, the most extraordinary aspect of Bedford Circus was that it was situated within the boundaries set by the original Roman city, laid down nearly 1800 years earlier. It wasn't built in a new suburb but was shoe-horned into a small medieval city, obviously designed to be a showpiece and a tour de force of domestic architecture, which it was. Although there were already a number of brick neo-Classical houses in the city by the 1770s (e.g. 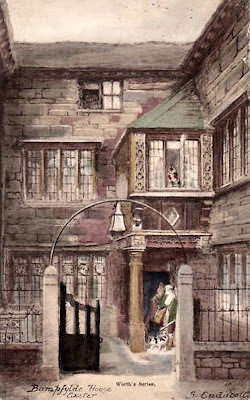 the Notaries' House in the Cathedral Close and Paragon House in South Street) they were still vastly outnumbered by timber-framed buildings of the preceding centuries. Stylistically, the creation of the Circus was something entirely new in the architectural history of Exeter. The size of its footprint rivalled that of the Cathedral itself. Only the superlative surviving fragments of Georgian architecture in Southernhay provide a hint as to what Bedford Circus was like. By 1874 "the quiet old Circus" was regarded as one of Exeter's "most characteristic features...admired by everyone who came to the city." As Peter Thomas states in his book 'Aspects of Exeter', "the aesthetic qualities of Bedford Circus were appreciated from the time its first houses were built until its substantial remains were completely removed by the local authority." It seems that the only people who didn't appreciate it where those responsible for its final destruction in the immediate post-war period. The aerial view right shows the full magnificence of Bedford Circus as it stood in the summer of 1928. Few cities in England could boast of anything comparable. 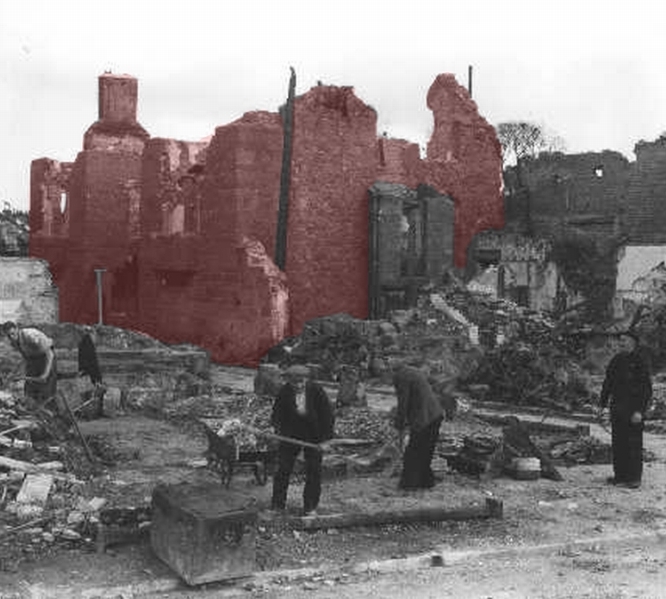 The end began in the early hours of 04 May 1942 when German bombs set light to much of Exeter's historic centre. The fire from burning buildings in the High Street spread east into Bedford Circus. By the morning many of the townhouses had been gutted by fire with only the walls remaining, although some did survived intact with just broken windows and missing roof slates. In almost any other European country Bedford Circus would've been reinstated and restored to its former state. It would've been too important to lose. Many of the walls remained sound and the task of reconstruction would've been relatively straightforward. Instead, the inexplicable decision was made by the city council to remove the Circus in its entirety. The burnt-out buildings were bulldozed, the few surviving townhouses were demolished, the railings ripped up and the old trees chopped down. Even the outline of the road fronting each crescent was erased during the post-war rebuilding. There is no excuse for what happened as Exeter lost, forever, one of its finest architectural treasures. The image left © Express & Echo shows the site of the completely destroyed Abbots' Lodge in the foreground with the badly damaged Choristers' School to the left. Highlighted in red in the background is the curving rear elevation of one side of Bedford Circus, with broken windows and damaged roofs, but structurally still intact, proving that parts of the Circus survived and could've been repaired and reconstructed with relatively little difficulty had the city council decided to do so. It's interesting to speculate exactly why the city council decided to destroy the Circus completely. The evidence suggests that once it was damaged they couldn't get the ruins down fast enough. Thomas Sharp, the town planner behind much of the city's post-war reconstruction wrote in 1946 that: "Bedford Circus has gone. The bombs shattered it to bits. It is so utterly destroyed that a man returning to Exeter can walk over its site without knowing he is doing so". Sharp was either lying through his teeth or he had been completely deceived about exactly what survived the Blitz of 1942 and what didn't. If he had seen the ruins perhaps he would've recommended a faithful reconstruction as he did with the Georgian townhouses of Dix's Field (although, despite this recommendation, the city council destroyed the remains of Dix's Field anyway as well as the facades of the two damaged terraces in Southernhay West). The council moved swiftly to remove almost all bomb-damaged buildings and it's likely that when Sharp arrived in the city to survey the damage all he saw were the cleared plots rather than the ruins themselves. John Summerson in his 1949 book 'Heavenly Mansions' stated that Bedford Circus had been "utterly destroyed by enemy action", and that myth has remained widely believed up to the present day, but the Blitz of 1942 in no way "shattered it to bits" or "utterly destroyed it". As Gavin Stamp writes in his book 'Britain's Lost Cities', in which Exeter has the dubious accolade of having a chapter dedicated to it: "Photographs taken for the newly established National Buildings Record show that, immediately after the raids, the Georgian facades of Bedford Circus and the damaged parts of Southernhay were still standing: surely they could and should have been shored up and retained?". The image right shows an aerial view of the city in 2011 overlaid onto which is the 1905 map of Bedford Circus. 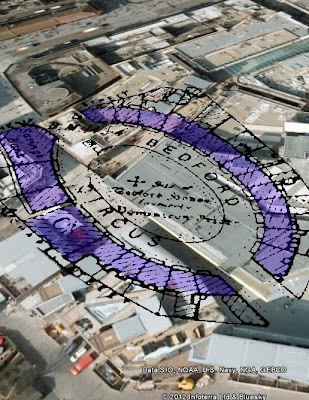 It give some rough idea where the two crescents were positioned in relation to the recent redevelopment of the area. So why wasn't Bedford Circus restored? The reasons probably include the economic reality of the times, as well as a more general desire to embrace Modernism, with its deluded promise of a cleaner, better society. One reason was a disinterest towards Georgian architecture in general in the first decades of the 20th century. But surely anothr reason which can't be overlooked is that of sheer, iconoclastic ignorance. 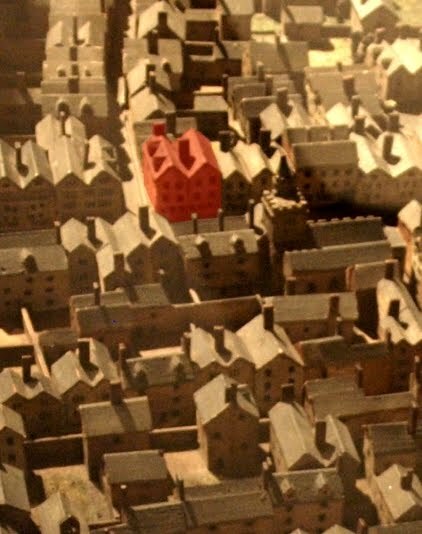 The same city council had no qualms about the demolition of dozens of medieval and Tudor townhouses during the slum clearances in the first third of the 20th century. It never seemed to occur to them that Exeter was targeted in 1942 precisely because of buildings like Bedford Circus. 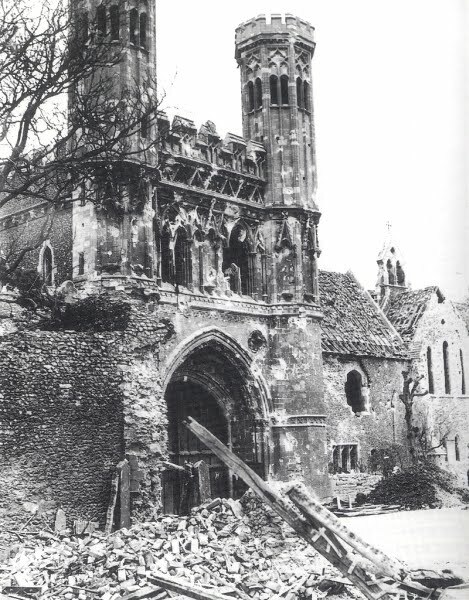 It never seemed to occur to them that in clearing away the damaged remains of so many historic buildings they were actually finishing a process that the Germans had already started themselves. The subsequent decades have shown that in Exeter historic buildings had almost no value whatsoever beyond a merely commercial one. If it was in the way of a new road then it came down. If it was in the way of a new shopping centre then it came down. If it could be replaced with something which provided more retail space then it came down. A building's historical or aesthetic value ranked well down the list of considerations. Thomas Sharp himself reflected on the fact that the city council's own pre-war guide to the city made absolutely no mention of Exeter's stunning Georgian architecture, despite the fact that A. E. Richardson had singled out the city's Georgian buildings for particular praise in the 1920s. Clearly it simply wasn't seen as being of any importance whatsoever. Exeter's historic architecture has been relentlessly squeezed between the two demands of catering for an increase in traffic and catering to commercial interests. The result was inevitably wholesale demolition in the 1950s, 1960s and 1970s that involved hundreds and hundreds of buildings, most of them in or around the historic central core of the city. And it wasn't a building here or a building there. It was acres and acres of property, entire streets and districts, totally flattened and redeveloped. In 1946 Thomas Sharp wrote that Bedford Circus was "so good that many people want it rebuilt as it was, want it restored in the fullest sense". (Even as late as 2004, when the Bedford Circus site was in the process of being redeveloped and decades after the original had been destroyed, letters to the local newspaper were fruitlessly calling for its reconstruction.) But the local authority had no intention of restoring it, let alone rebuilding it from scratch. The remains of the Circus were pulled down, although the chapel walls remained standing up to 1949. 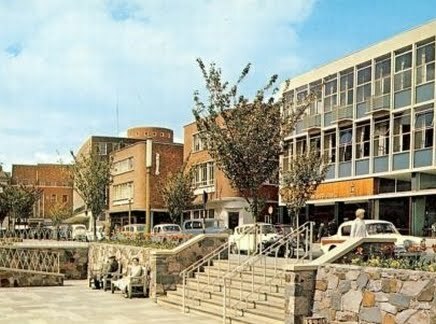 In its place Thomas Sharp planned a pedestrianed shopping precinct, allegedly the first of its kind in England, to be known as Princesshay above right. Part of this was to occupy the site of the north-eastern side of Bedford Circus. The rest of the site was taken up with a much-altered Bedford Street, including a row of low shops standing where the south-western crescent and chapel had stood. It was all mind-numblingly mediocre. Bridget Cherry called these post-war shops "depressingly shack-like", adding that it was all "a poor compensation for the loss of the Georgian Bedford Circus." Between 2005 and 2007, the entire area was demolished again and rebuilt as yet another clone shopping precinct. The improvements are negligible as the new precinct's architecture is as banal as its predecessor. It already looks dated and no doubt in 20 years time it will in turn be demolished and something else built in its place, and so on and so on. The image below shows part of the new Princesshay shopping precinct that now stands on the site of one side of Bedford Circus. Drag the handle with your cursor to see before and after images! History has judged the council's demolition of Bedford Circus justifiably harshly. W.G. Hoskins, probably Exeter's most significant 20th century historian and one of the founder members of the Exeter Civic Society in 1961, called it an "unforgivable act of vandalism". Peter Thomas states that "to have destroyed it all is unforgivable." According to Todd Gray, a contemporary historian, Bedford Circus was "destroyed partly through the Blitz in 1942 but more due to the indifference of city planners." 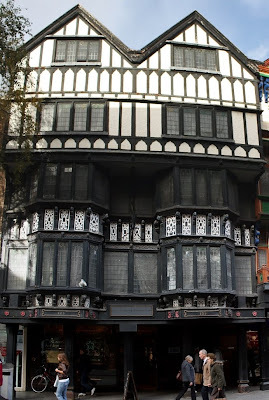 Considering its prominence on the High Street, surprisingly little is known about the building which once stood behind this towering Tudor facade. The postcard left shows No. 226 in the centre with the mid-17th century facade of No. 227 High Street to the right. It's not even known for certain whether the building was originally a single house or a pair of matching houses. Matching pairs of houses were a much more frequent occurrence in the city during the 1500s and 1600s (Nos. 41 & 42 High Street are two surviving examples). If it was constructed as a single residence then it would've been on a scale almost unprecedented in mid-16th century Exeter, although there were exceptions: No. 1 Cathedral Close, a single house from c1596 with a facade of almost comparable dimensions has a similar arrangement of windows on the first and second floors. However the confined plot of No. 1 Cathedral Close resulted in a much smaller building internally. Another piece of evidence in favour of it being a single large house comes from Exeter's pre-eminent 20th historian, W. G. Hoskins. Hoskins believed that the property was constructed for Thomas Prestwood in 1567. Prestwood was a merchant as well as Exeter's mayor in 1544 and 1550. The idea that Prestwood had an enormous house built for himself as a reflection of his personal wealth and social status is certainly plausible. Unfortunately the later history of the property has meant that key questions regarding its original layout will probably remain unanswered. The postcard right c1900 shows No. 226 highlighted in red. The unrestored upper two floors retain their rendered appearance. Whether it was a single house or a matching pair, when completed in the 16th century it would've been enriched with some of the most opulent interiors in Exeter. The fact that there is no documentary evidence for these interiors suggests that the property had been modernised by the 19th century. Even the Victorians liked to marvel over plasterwork ceilings and oak panelling before ripping them out, and yet there is silence about No. 226. If it had ever been two houses then by the end of the 18th century it had been knocked into just one. In 1781 it was purchased by Robert Trewman, the founder of the 'Exeter Flying Post', and the newspaper was printed from No. 226 until 1862. It's possible that Trewman himself was responsible for a number of the alterations. At the beginning of the 20th century substantial renovations began, especially to the facade. Work started on the top two floors and, according to Peter Thomas in his book 'Aspects of Exeter', the workmen made such a mess of it that in 1907 another firm was brought in to complete the job. Westcott, Austin & White seemed to do a better job on the first and second floors, removing each of the timbers, cleaning it and repairing it, or replacing it with old timber taken from within the house itself. When the old render was removed from beneath the oriel windows some original strap-work painted decoration was discovered dating from the time of the building's construction in the 1560s. This too was restored. Unfortunately the insertion of the new shop front, which was also added in 1907, saw the lower part of the painted decoration cut in half, but the most impressive feature of the facade, its canted bay windows, were treated sympathetically. The row of windows which run across the entire facade, supported on brackets carved with crouching beasts left, on both the first and second floors are exceptional. The property narrowly escaped destruction during the Exeter Blitz in 1942 and was officially granted Grade II* listed status in 1953. 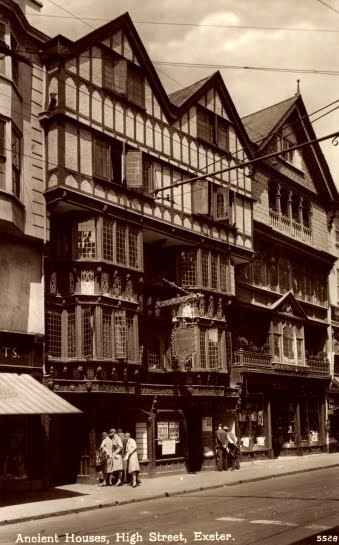 And yet, despite the fact that it was one of Exeter's finest surviving Tudor frontages, the city council decided in 1958 to demolish it and its neighbour at No. 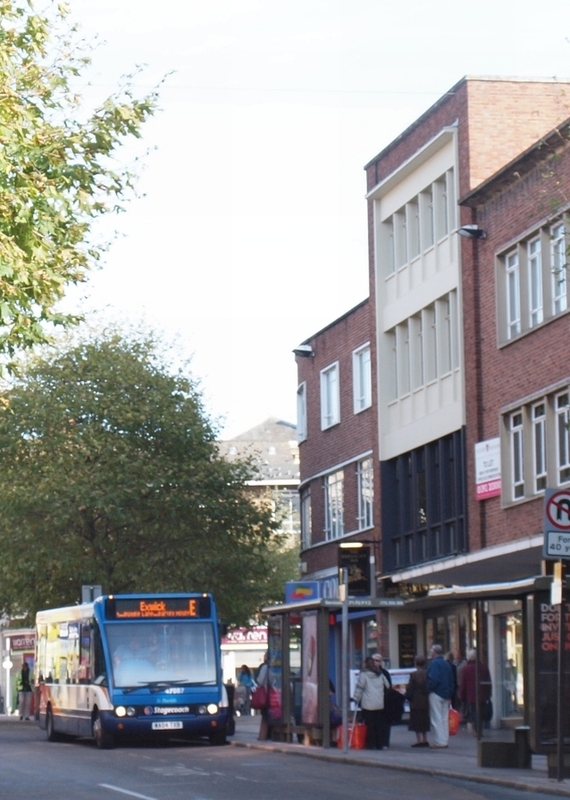 227 to allow the High Street to be widened. 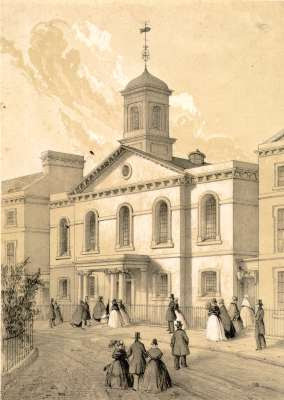 The building had actually been purchased by the city council in order to facilitate its destruction, an action which prompted the local newspaper to run a cartoon with the caption: "Come to Exeter and Watch the Natives Pull It Down". (The cartoon could've been run many times during the course of the 20th century). The plans created uproar and the idea was shelved, but in 1959 the demolition was back on the agenda. The building was reprieved yet again until 1960 when the local authority pressed harder to have Nos. 226 and 227 removed. Being a listed building meant that the city council had to apply to the government for their removal. The government acquiesced to the council's plan and both properties, like so many before them, seemed doomed. The row rumbled on into 1962 with groups like the Exeter Civic Society led by W. G. Hoskins arguing against the demolition. The photograph right © Devon County Council shows No. 226 shortly after its restoration. A new shopfront has been added but its ground floor remains intact. It wasn't until 1969 that the city council deigned to allow the building to remain, sort of. It is blatantly obvious that if it hadn't been for local opposition to the plans then neither No. 226 or No. 227 would still exist today. (The same is true of a number of buildings in Exeter which survived the war only to be threatened by the city council's bulldozer afterwards. The Higher Market would've been razed to the ground if it weren't for the Exeter Civic Society, a group which, according to the archaeologist Aileen Fox, was regarded by the city council as "an ineffectual nuisance"). Ignorance of such a magnitude is never anything less than breathtaking. The historic frontage was reprieved but the rest of the building wasn't. In the early 1970s everything except for the facade was demolished without any archaeological record being made of what was destroyed. (No. 227 received the same treatment). Although it's clear that there were no visible remnants of the Tudor interiors surviving at the time it's impossible to say what actually was demolished. The cellar was filled in, the remaining walls were completely removed and replaced with a modern structure, but even worse was to befall the ground floor. 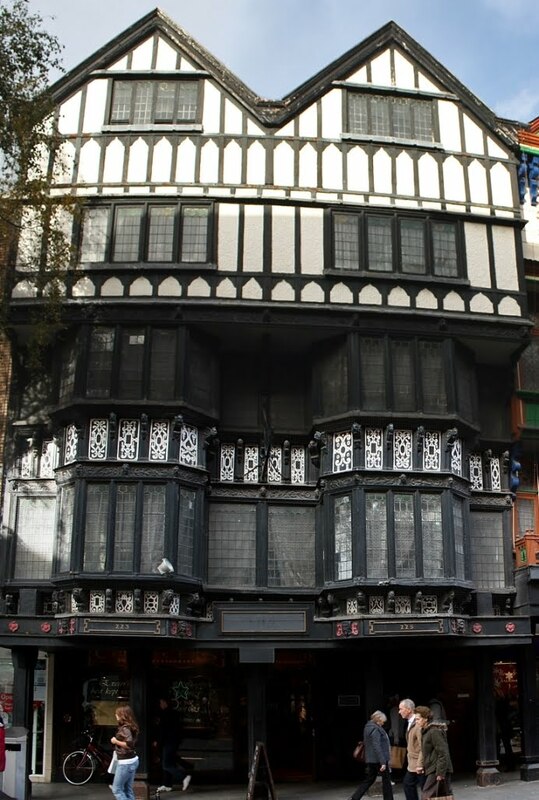 Until the 1970s the ground floor had an attractive shop front which had been added in 1907. Following the demolition of the rest of the building the ground floor was completely removed and the surviving timber facade was jacked up onto steel girders to allow pedestrians to walk unimpeded underneath, like a 20th century butterwalk. If that all wasn't bad enough the pre-war properties on either side of No. 226 and No. 227 were both demolished and replaced with modern red-brick structures. The buildings opposite, including No. 37 High Street, of a similar vintage, were destroyed in the 1950s, and today neither No. 226 or No. 227 can be enjoyed as part of a satisfying historical cityscape. They now stand alone amidst a sea of second-rate red-brick banality and because of this, despite their genuine antiquity, look remarkably like Tudorbethan imitations. So what actually does survive of No. 226? 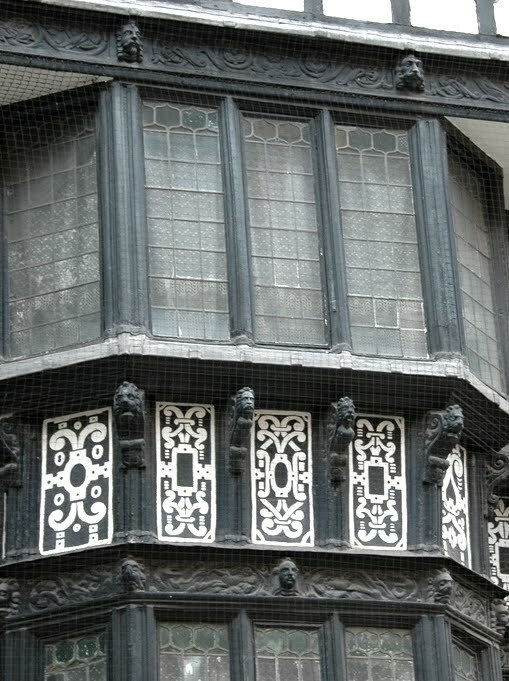 The windows on the first and second floor, although restored, are authentically Elizabethan, as are the decorated panels. The timbering on the upper two floors is totally fake but there's a good chance that the original fabric of the house still exists beneath to a depth of perhaps 12ft. The complete removal of the ground floor had dire consequences for the overall impression of the facade. Without the vertical plane of the shopfront the splendid effect wrought by the oversailing upper floors has been totally lost. It is essentially a 1970s building with an authentic, if restored, Tudor facade pinned to the front. Despite the massive alterations the building retains its Grade II* listed status, primarily because of its magnificent windows.